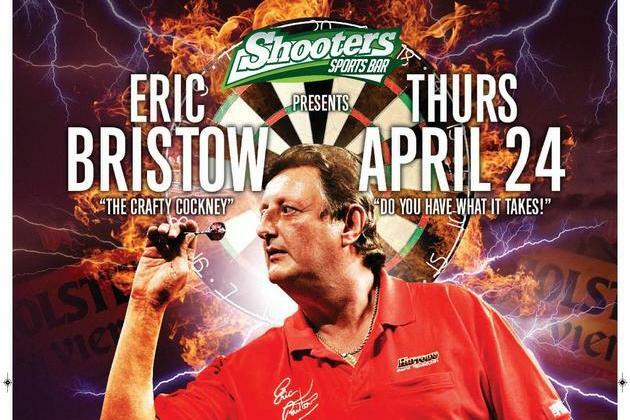 Thursday 24th April 2014, Shooters Sports Bar, part of The Bierkeller Entertainment Complex in The Printworks, Manchester, will play host to the legendary Eric Bristow MBE, the five times World Darts Champion otherwise known as ‘The Crafty Cockney’. Eric will be meeting fans and signing memorabilia at the event, which will run from 1pm until 4pm. Entry is free, and it is only £2 to enter the darts tournament beginning at 1pm, in which fans will have the opportunity to challenge Eric and play a leg of darts against the man himself. A free bottle of Holsten Vier is up for grabs for whoever can score more points in nine darts than Eric himself can score in six! All proceeds raised from the tournament will be going to charity. An English sporting legend, Eric was ranked the world’s number one dart player for seven years in the 1980s, making him one of the biggest names in World Darts. Now working as a commentator for Sky Sports TV, Eric also starred in a recent series of ITV’s popular show ‘I’m a Celebrity Get Me Out Of Here!’.